Sharjah airport's slogan is catchy and to the point. 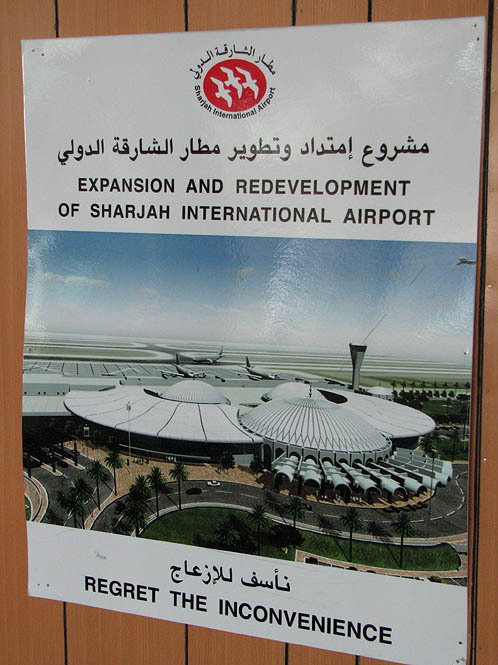 "Sharjah International Airport: Regret the Inconvenience!" I must say I have definitely done just that every time I'm flying AirArabia. The most inconvenient part, of course, is the immigration queue, more commonly known as the Trail of Tears. Every day a few people die of old age while waiting to get their passports stamped, which is even more tragic since many of them were still children when they got off the plane. Trying to get to town from the airport isn't much fun either. There's theoretically a bus but I've never seen it. The only other option is an SUV taxi, something I would normally refuse on ethical grounds if the alternative weren't a several-mile hike through the desert with my luggage.